The Syrian opposition is trying hard to get its do-it-yourself revolution cooking. It’s breakfast for 8 young revolutionaries living in this house. Most have never lived away from their mothers before. The setup here is pretty basic. Most of the guys sleep on the floor. And they are doing the cooking and cleaning for the first time in their lives. And they’ve certainly never worked in politics before. Political activity in Syria, for the last 40 years, has meant supporting the ruling Baath party or jail. These men came here just a few weeks ago from the refugee camps inside Turkey, after an opposition supporter agreed to pay the rent. Nazir Al-Abdo is one of the leaders. 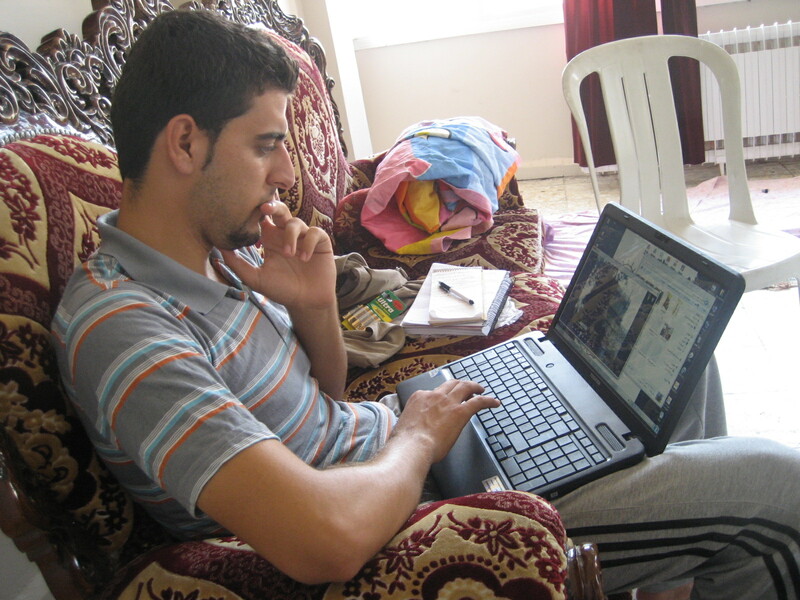 He was studying sports at the university in Latakia before he fled. Al-Abdo and the others don’t have documents so their movements are limited. “We don’t go outside at all so that nobody sees us,” Al-Abdo says. “We always hiding. We don’t have the right be here. We don’t have passports. Al-Abdo didnt have much time to think before he fled. He was involved in protests and still went to classes like a normal student. But then ten minutes before his exam, his phone rang. “My brother called me and said don’t enter, the security forces will come to your university and take you,” Al-Abdo says. “I said ‘it’s not possible. I will just go to the exam.’ He said, ‘they will come and take you.’ I didnt go to the exam. The television in the living room shows grainy cell phone images of corpses and chaos in Syria. Its the opposition Syrian Al Shaab satellite channel. The men in this house may not go out but they do get visitors. Young men show up with more videos, smuggled out on flash drives. One of them is a 20 year old who wants to be called Ahmed. He snuck out of his refugee camp. Ahmed says that if he’s caught outside the camp, Turkish authorities could send him back to Syria. “Of course its dangerous,’ Ahmed says. “But I will do it for my homeland Syria, because I have to help. The world needs to hear our stories.” The oldest revolutionary here, at 35, is Jamil Saeb. Saeb says the opposition wants Syria to be like Egypt, not Libya. In other words, to topple the regime through peaceful people power and international pressure. He says violence simply wont work in Syria. His priority, he says, is to create a small unified organization and present clear ideas to the world. By doing things such as translating its Arabic webpages into English. Al-Abdo is watching another video of protests in Syria. “You see they shot just on innocent people,” Al-Abdo says. “You see how they run, they will die for freedom.” Nazir Al-Abdo is frustrated. No foreign reporters are allowed in Syria, so independent verifications of activists’ accounts are not possible. And he’s tired of having to prove that the Syrian government is brutalizing its people. But clearly the message is getting out. The United Nations has condemned the Assad regime in Syria. But Al-Abdo and others wonder why America and Europe aren’t doing more.